Your company likely dedicates a significant amount of time and resources to customer service. If helping your customers solve their biggest challenges is important to you, then shouldn’t your marketing strategy reflect that same focus? It saves you from getting buried in the noise. Hard-core sales and marketing tactics don’t work anymore. Your customers are inundated with sales messages from multiple channels throughout the day. Even though your ultimate goal is to sell, you can’t start by telling people how great your products and services are. They simply won’t care. It keeps you focused on your customers. Inbound marketing motivates you to explore your ideal customers through buyer personas, and identify their position in the buyer’s journey. This helps you figure out who they are, what they care about and what they’re searching for. It empowers you to create content with a purpose. Once you fully understand your customers, you can create content that speaks to their specific needs and problems. This will lend credibility to your company and help you build rapport with potential customers. It enables you to optimize your content. Inbound marketing strategies help you identify your most relevant keywords and incorporate them within your content and website. These keywords are directly related to the kinds of questions that your customers are typing in their search engines. It helps you promote and distribute your content. You can use landing pages, blog posts and social media channels to reach customers with your targeted content. If you publish educational content that’s easy to locate online, then your customers will be more likely to find your company, trust your expertise and choose your product or service when they need it. And they’ll be more likely to return as a repeat customer and to recommend your company to other potential customers. 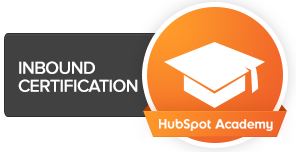 To help you master the art of inbound marketing, HubSpot has created an online inbound marketing course. This free program features 12 classes designed to help marketers in any industry grow their business and expand their marketing skill set. Our resident content developer, Emily Owens, recently became inbound certified. Armed with this training, she’s ready to help you create content that educates your customers and helps you succeed in today’s competitive market. To get started, contact [email protected].